BearCat. Photo: Haverford Police Department Twitter account. Another portion of Pennsylvania government has been rudely awakened to their new legal responsibility to be transparent. Back in May, Delaware County’s Emergency Services Department got a new vehicle: a BearCat produced by Massachusetts-based company Lenco Industries. 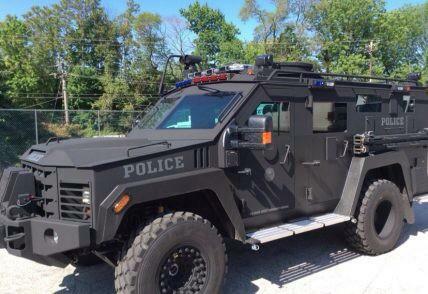 The BearCat is a heavily armored emergency response vehicle with a number of features for offensive use, such as a gas injector and a battering ram. You can look at Lenco’s pricing quote here. According to a press release from the Delaware County District Attorney, the BearCat may be used by any law enforcement agency in the county, as well as the Philadelphia Police Department. The vehicle was purchased using Urban Area Security Initiative grant money from the Federal Emergency Management Agency. When I requested records from the county about the BearCat, including the grant application and policies for lending the vehicle out, under the relatively new state Right to Know Law, the county denied them, claiming that they would endanger a public safety activity, and, more bizarrely, that the records could also compromise sensitive infrastructure, including computer infrastructure. I appealed to the state Office of Open Records, and yesterday, the Office ordered that the county release the records to me. Among the other bizarre turns the case took: according to the final determination from the Office of Open records, the county presented “no evidence” to support its contentions that the records were exempt, despite the requirement in PA that the agency denying records bear the burden of proving that they are exempt. The county also claimed that the records didn’t need to be provided because they were held by the Southeastern PA Regional Task Force, an interagency coordinating group composed entirely of law enforcement agencies, a claim that was also rejected by the Office of Open Records. The county appears to be acting as if the requester still bears the burden to prove the records requested are public. In fact, in the county’s original denial letter, they instructed me to file “exceptions” with the county for each record I believed to be public, which was the appeal procedure under the old state records law. The only change from the old language was that the Office of Open Records in Harrisburg was listed in the space where the appropriate county office to send exemptions to was once listed. Since the passage of the Right to Know Law in 2009, however, the burden of proof is now on an agency to prove the records are exempt, and it seems as if the county may be ignorant of or confused about this development. Delaware County has a month to decide whether to appeal this decision in the courts or release the records; if they do neither by the deadline, I will have the option to seek a court order for the release of the records. The Declaration will have a story about the purchase itself once the records are released. Want more public records stories from Austin Nolen? Follow The Declaration via email, and connect with us on Twitter and Facebook.